An ecommerce-enabled website is the foundation of every online seller's business. A key component in how well that website performs and how much it costs to maintain is where the site resides. At present, there are four ways a website can be hosted, including on-premises with a business' own server, in the cloud, with a hosting service, or through a software as a service (SaaS) provider. Let's define each of these approaches and consider some of their advantages and disadvantages. An ecommerce business — whether it sells shoes to individual shoppers or wholesales lug nuts to auto repair businesses — can install ecommerce software on a server located at its own facility. This is called the on-premise or self-hosted model. This approach gives a merchant complete control over and direct access to the hardware running its site, but also requires direct investment and constant server monitoring and maintenance. There are, perhaps, three advantages to the on-premise model. Each of these benefits assumes that a particular business is better at configuring, managing, and maintaining servers than others are. Security – if your business chooses the on-premise model, you have complete control over security. If your staff is better at encryption or server configuration than average, you can develop a relatively more secure site. Performance – your skilled server and network administrators can optimize your site, which can boost performance in some cases. Control – in the case of open source software, the on premise model will give your business access the ecommerce platform's code. Some believe this will give you more control to optimize and modify your site, even potentially adding unique features. The on-premise model quite literally pays a heavy price for its benefits. By some estimates hosting a popular licensed ecommerce platform like Magento Commerce on premise might cost $200,000 per year or more for mid-market retailers. 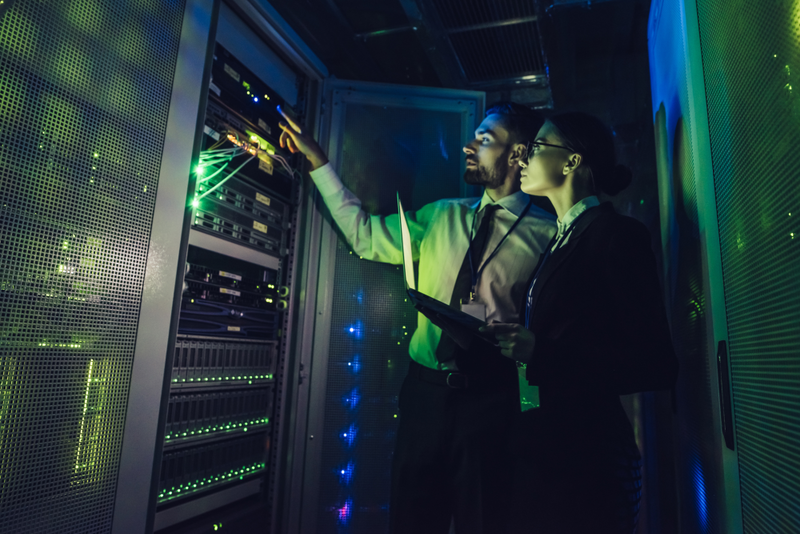 Infrastructure – in the on-premise model, your company owns or leases all of the hardware, which will need to be upgraded or replaced every three-to-five years. License fees – if your business self hosts your ecommerce platform on premise, you may need to pay license fees for your ecommerce software, server software, and much more. Paid employees – your company will need one or more administrators to monitor and maintain your servers. In 2018, a typical web server administrator in the United States earned $69,077 a year, according to Glassdoor. Security – also listed as an advantage, security can be a problem too. What if your server administrator is not better at configuring your server? Or what is she forgets to install an important update? In the on-premise model, your company is completely responsible for data security and Payment Card Industry Digital Security Standard (PCI DSS) compliance. Performance – while your company may be able to optimize the performance of your server, you won't necessarily have the advantage of deploying across a content delivery network, as an example. Backups – what happens if your server fails? The on-premise model requires your business to purchase additional hardware to backup your data for fear of catastrophic events. It will not scale – ramping up during peak selling seasons might require adding more hardware that you won't really need other times of the year. The term "cloud" or "cloud computing" can have many and nuanced meanings, but in the context of an ecommerce platform, cloud describes infrastructure as a service (IaaS). If your business chooses to host your ecommerce site in the cloud, you will be paying to use virtual servers and other hardware. In many ways, the cloud has all of the advantages of self-hosting on-premise and more. No capital expenses – your company won't have to buy or lease a server and you won't need to worry about updates or replacements. Easy data backups – backing up data or entire servers is easy in the cloud. It scales – during peak sales periods, you can add servers to manage the additional traffic. With IaaS you pay for what you use, so there is very little wasted investment. Security – IaaS providers like Amazon Web Services or Microsoft Azure will give you significant control of server security. If your company has a skilled administrator, this can be an advantage. Performance – your company will have control over server configuration, plus you will be able to use a content delivery network. Control – in many cases you will also have access to your ecommerce platforms' source code, giving you the option to modify or customize it. Paid employees – your company's cloud servers will still need an administrator. Your administrators won't have to worry about hardware particulars, but configuring and maintaining your cloud deployment is not automatic or even easy. License fees – server software will likely be included with an IaaS solution, but ecommerce license fees won't be. Cost – compared to the on-premise model, hosting your ecommerce platform in the cloud is less expensive, but a mid-market online retail might still expect to pay $170,000 for Magento Commerce in the cloud when you include the aforementioned employees and license fees. The popularity of the IaaS cloud and the "many and nuanced meanings" of the term "cloud" have muddied the distinction between IaaS and a hosting service a bit. But for our purposes, a hosting service is a company that manages server and server-related services for you. Companies like Nexxcess, Rackspace, and Hostgator are all examples of hosting services. These business will take care of all of the required hardware and give your company access to a server via SSH or a portal like Plesk. Server maintenance – hosting services manage the hardware and basic server configuration for you. For many ecommerce businesses, this means they won't need to hire an administrator. Support – if your server or site fail, hosting services can help. Most of these companies have technical support teams to help troubleshoot and correct problems for you. Security – hosting services have experience with server configuration and usually keep everything up-to-date and ship shape. Low cost – compared to hosting on-premise or in the cloud, a hosting service can be very inexpensive. License fees – in some cases, your business will still need to pay software license fees. For example, Magento Commerce is at least $24,000 per year for even the smallest seller on the least expensive hosting plan. Performance – while a hosting service takes care of your servers, they may not optimize them for your specific application or industry. Your business doesn't have the control needed and the hosting service probably won't do much to help performance without charging additional fees. Security – your business doesn't know where or how your data is stored or secured. Extremely low-cost hosting services may not be PCI DSS compliant. The final model is software as a service. SaaS let's a business focus on what it wants to accomplish — for example selling stuff online — without worrying about servers, networks, or even cybersecurity. Low cost – relative to on-premise hosting and the cloud, SaaS can be very inexpensive. The same mid-market retailer that had to pay $200,000 a year for an on premise Magento Commerce implementation could pay less than $2,500 per year for a leading SaaS solution like 3dcart. No Server Administrator – your company won't need to hire server administrators at $60,000 or $70,000 a year each. Service – a good SaaS provider, like 3dcart, provides comprehensive and highly available support services. Performance – SaaS ecommerce providers are focused just on ecommerce, so they optimize the servers your site runs on. This can mean much faster load-times for your customers. Security – your business' SaaS partner takes full responsibility for PCI DSS and cybersecurity. SaaS companies can take what they learn from hundreds or even thousands of active sites to ensure that your business and its data is secure. Features – SaaS providers compete on their software, thus, SaaS companies can often be the first to introduce new features. Extensibility – your company will be able to easily extend your SaaS platform with apps. Want email marketing integration? How about Kalviyo or MailChimp. Both of these companies have 3dcart apps. Ease of Use – not worrying about software installation, server maintenance, and the like makes SaaS much easier to use. Time to Market – SaaS ecommerce platforms are much faster to deploy, so your new site can be up and selling sooner. SaaS is, perhaps, the best choice for many, if not most, ecommerce businesses, but it is not without challenges. Flexibility – some company's argue that not having access to the server or the source code limits flexibility. If you wanted to change a SaaS ecommerce platform's core code, you could not. However, nearly everything else in SaaS is configurable. Customization – SaaS platforms work with themes or templates. Thus, if you wanted to do something completely unique or break ecommerce conventions and best practices those changes may be more difficult with SaaS. How an ecommerce platform is hosted impacts how well it will perform and how much it will cost. For this reason understanding the advantages and disadvantages of these four ecommerce hosting models can help you make a better decision about your ecommerce platform.